My wife and I are heading to Hong Kong over New Years for a wedding and will have a few extra days to sightsee. Any recs for Hong Kong or anything to avoid? Thanks much. luk yu tea house, ask your hotel for directions. very old school dim sum. get the barbque pork pie, but everything is great. this is the type of place families have been going to for generations. order a lot more than you can eat, it isn't that expensive, and you want to try a lot. maks noodles for lunch - also sort of an institution. the curried pork noodles is great, but anything with the noodles will be great. Jumbo Restaurant is a must see -- but avoid eating there. Maybe cocktails. But the food I had there was awful. However, when you're a giant floating restaurant covered with a million lights, with 12-foot gold dragons with flaming eyes flanking the door, all reflected in the surrounding water, I guess you don't have to think about the food. Definitely one of the visual delights of Hong Kong, but not a culinary highlight. Street vendors sell great stuff, including great juices and thick, rich coconut milk. Indulge in a glass. It is worth having one meal in the lobby of the Peninsula Hotel. This is the original Peninsula, long considered the best hotel in the world. It's still glorious, and the lobby offers very good, generally very European food. But it's fun to dine in an icon. 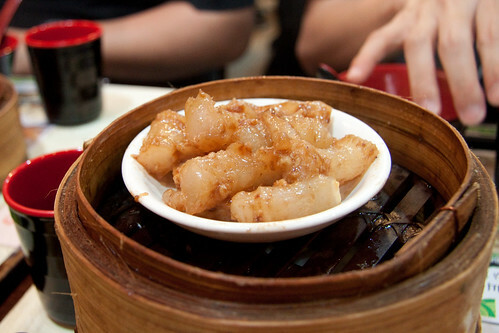 Victoria Peak is not a foodie destination, but is still a must-see. Take the tram to the peak. And try to see the bird market -- nothing like it anywhere else I've been. Only other recommendation is to pick up some of the self-guided walking tour booklets offered by the Hong Kong Tourism Bureau. They are wonderful for wandering around the older parts of HK, and take you into tea shops and to Chinese herbalists, as well as suggesting an occasional place to stop for a snack. Because ultimately, despite the great subway system and the joy of taking the Star Ferry, Hong Kong is best experienced on foot. 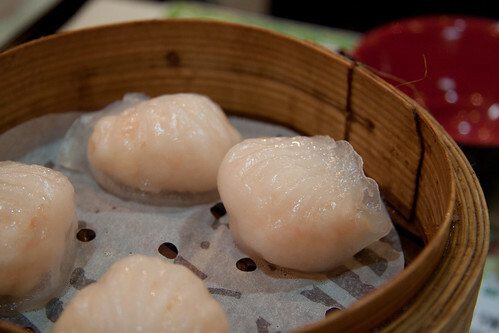 Just a note about dim sum is that on the off peak times the prices are great discounted. Typically before 10:30 and after 2. Da Ping Huo, which I wrote about here, is a really cool spot if not exactly old school Hong Kong (not even Cantonese, actually). If you have a native speaker with you or are feeling particularly brave, some of the best meals I've had in Hong Kong have been at Lei Yue Mun, the outdoor fish market, where you can walk around, pick out all kinds of live seafood from tons of vendors, and runners will take it to a restaurant around the corner where the first plates will start hitting the table when you finish your shopping and have a seat. It's been a long time since I've been and we always went with somebody who spoke, so I'm not sure if language might be an issue. But if you can make it happen, ho buddy. Also, a bit of an unusual recommendation, but if you find yourself near Pacific Place (Admiralty), the food department in the basement of the Seibu department store inside houses a little gelato stand called I Scream. The gelataio, Paolo Predonzan, is an Italian who trained in both Italy and Vienna and he makes what may be the best gelato I've had anywhere, Italy included. The guy's a true artist, and in addition to the classics he's done a really wonderful job of adopting the local flavors. You've got China to see... no need to truck across town for it... but if you're in the 'hood, it's definitely worth a detour. Thanks for the ideas. If I find anything worth while, I'll report back. I lived in Hong Kong twenty years ago, so I’m sure much has changed in the meantime. There are a few culinary highlights though that should not be missed. 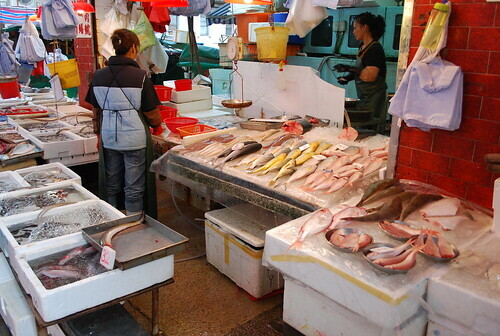 Lamma Island is known for its fresh seafood. You can catch a ferry from Hong Kong island. The ride out to Lamma is a beautiful way to see the harbor and get a real feel for Hong Kong. Lamma itself is worth an afternoon. There were no cars—and I assume that’s still the case—and there’s a couple of nice hikes which will give you a sense of Hong Kong’s more relaxed outer islands. 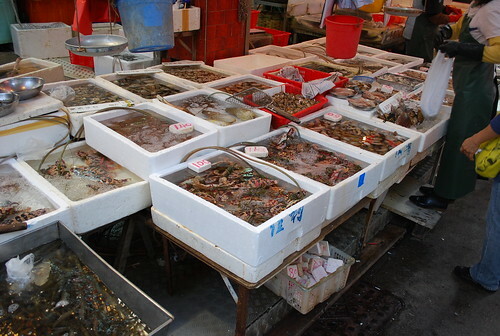 The harbor in Lamma was lined with seafood places where you sat outside. The best thing here was fresh shrimp and the best preparation was usually referred to in English as “just boiled shrimp.” The shrimp are boiled just until they’re ready and then served with a Cantonese dipping sauce—I think basically it was a light soy sauce and some chili, but the simplicity of the dish was what made it so wonderful. Also, I don’t have a lot of specific restaurant recommendations because I was living there with my future ex-wife, and her family’s friends and relatives pretty much just took care of us. We ate daily at amazing places and sometimes at family banquets that were truly spectacular, but I only remember a few names. I would recommend three dishes, however. They are: roast squab, drunken shrimp, and beggar’s chicken. 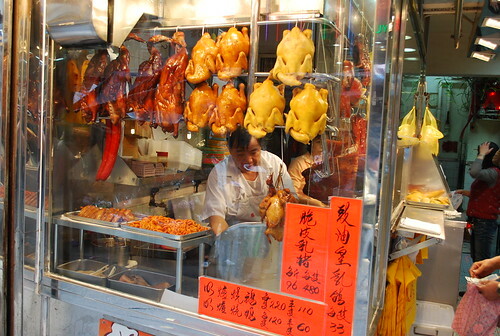 Roast squab is a delicacy often served as part of a multi-course Cantonese banquet and you can get it most Chinatowns. I thought it tasted significantly better in Hong Kong though. Drunken shrimp is a high-end restaurant sort of dish. They pour alcohol all over the shrimp which makes them go crazy and then they light them on fire. It was quite delicious. Beggar’s chicken is chicken wrapped in lotus leaves and then wrapped in mud—supposedly based on how people would hide chickens from their masters and cook them in the ground in the old days. Peking Garden in Star House is a very touristy place, but the Peking duck and beggar’s chicken were both quite good there twenty years ago. You never know whether the sorts of places that cater to tourists hold up over time though. There are probably better places for beggar’s chicken now. I would ask locals where they would eat it if they had a craving for it. I hope you have a wonderful trip. This time is one of the best times to go. The weather is less humid than the rest of the year, and it’s not too chilly yet. I was fortunate enough to spend a few days in Hong Kong on a very, very high-end tour of China with clients of mine some years back, courtesy of a tour operator I was working for at the time. 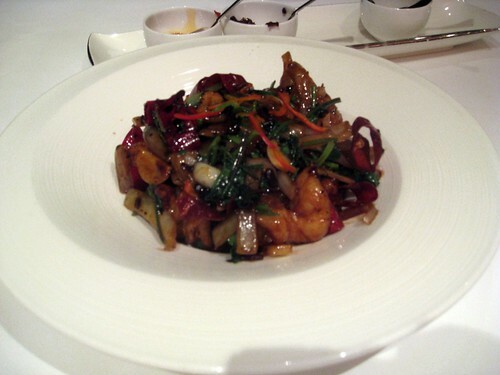 I had excellent, memorable meals at Vong in the Mandarin Oriental Hotel, and at the China Club. I would happily revisit either repeatedly should I make it back to Hong Kong. 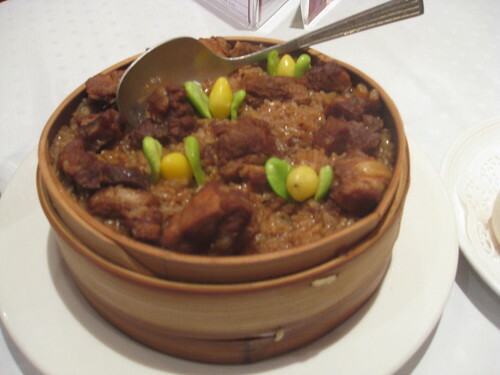 That said, my single favorite meal was at Yan Toh Heen in the InterContinental Hotel. Both a branch of Nobu and "SPOON by Alain Ducasse" have opened in the same hotel since then and appear to be rather trendier these days, but I wouldn't even think twice about bypassing both for a dim sum dinner at Yan Toh Heen. I was extraordinarily nervous as it was the first group dinner and I was very concerned with making a good impression on some very important clients. Oh, and I was 23 at the time Despite that, I found at least a few moments to thank any higher power that might care after my first bite of each offering for the incredible opportunity to enjoy such a meal. Even the jellyfish, which came as quite a shock to a young and inexperienced palate. The atmosphere is great. The view of Victoria Harbor is to die for. Neither hold a candle to the food itself. The InterContinental is across the street and just down from the Peninsula. The Hong Kong Museum of Art is on the same side of Salisbury Street - it might even be immediately next door to the InterContinental, I cannot recall exactly. A truly decadent half day or so that would never be forgotten would be afternoon tea at the Peninsula, a few hours at the HKMA, and dinner at Yan Toh Heen. We had dim sum at Serenade and it was truly wonderful. 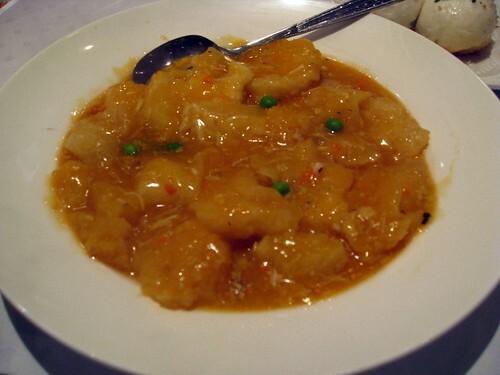 I'm sorry I don't have pics but here's another reviewer with pics (http://food.rumspace.com/2007/04/09/hong-kong-serenade-chinese-restaurant/). Our menu was decided for us since there were about 60 people there. My favorites were the radish cake and chestnut soup but everything was really good. The wedding reception was at Cuisine Cuisine, a modern Cantonese restaurant in the IFC mall (everything seems to be in a mall in HK) - http://www.ifc.com.hk/english/restaurant.aspx?id=3101. We had a 12 course meal and the only thing I didn't enjoy was the marinated goose foot. Sorry again, no pics. The menu was very much in season - greens, fungus, mushrooms, etc. 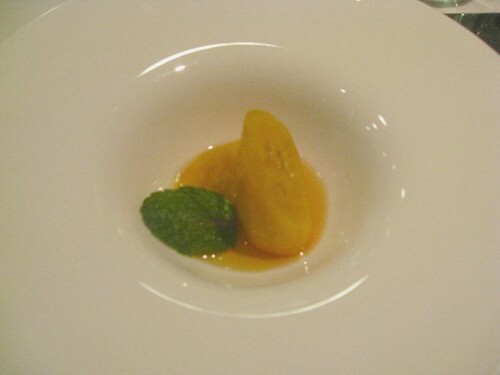 We ended our trip at Bo Innovation, the only gastronomy restaurant in HK (http://www.boinnovation.com/main.html). We had the chef's menu and it was very good. Again, no pics, - I know, I know. There are some pics on the website. 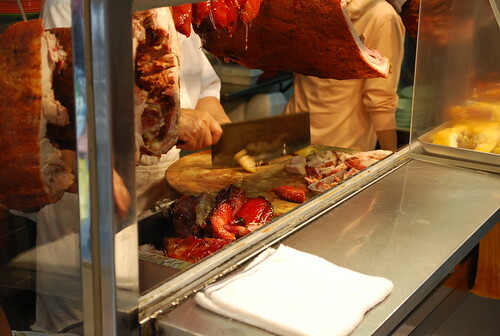 You may have seen this place on Anthony Bourdain's "No Reservations" Hong Kong. The chef, Alvin Leung, is the rock and roll chef that has turned traditional Cantonese food on its ear. Every dish has a traditional equivalent. Chef Leung came over to our table after dinner to see how the dish was and was very kind. Since we were there with the newly married bride and groom, he bought us a round of champagne. He told us that he changes the menu every 3-4 weeks, with the seasons or themes in HK. He also said that he can't do true "gastro" in HK because the Chinese don't want a show but rather a meal so it's a fine line he walks. He does it very well and I would highly recommend a visit. You'll need reservations but our Monday night meal was pretty quiet. It's a very nicely appointed small space and the service was very good. When he left, he told me to say hello to Trotter for him - ha! The in-between meals were great as well. Here are some pics from the mid-levels, where you can still see some of the old HK streetscapes. Bourdain was down this path as well, apparently, eating "fast food" Chinese-style. This whole area was a food market. Unfortunately, we hit the area (not knowing about the food) right after a huge breakfast so I didn't sample any of it. Obviously, my biggest regret. Across the street from Yung Kee is Tsui Wah Restaurant, just as busy and the service twice as brusque (usually a good sign, actually). Here, the Hainan chicken rice is a must. Though the dish is unknown in America, this is spaghetti-and-meatball-level comfort food to Southeast Asians. "Hainan" stands for the South Sea, referring to the Singaporean and Malaysian influences that have spread this straightforward chicken rice dish east to Hong Kong. Quite simply, it's poached chicken, accompanied by a sweet chili and ginger/scallion sauce. Avian flu jokes aside, the chicken here is the silkiest, most succulent and flavorful I've ever tasted. And the rice is just as tasty: plump, sticky morsels with a chicken-fat-enhanced sheen. It's possible that more great dishes exist per square mile in Central than anywhere else in the world. Perhaps it's because this area is the financial capital of Asia, and high-powered suits crowd these restaurants by the thousands come noon. You'll see plenty of white collars and ties at Mak's Noodle, where wontons are the be-all and end-all. A quick lesson: Westerners are familiar with taste textures such as crispy and crunchy, but the Chinese have the concept of "songh." It's a springy mouth feel, a sensation that evokes brightness and freshness. At Mak's Noodle, shrimp wontons have that quality, with five or six ethereally smooth dumplings accenting the bright, perfectly al dente soup noodles. A splash of red vinegar adds complexity and bite. Until 1997, Hong Kong had been ruled for a century and a half under the British flag. Thus, many Hong Kong restaurants have an Anglo tinge. Places called cha chaan teng (or tea restaurant) are the best example of this. You'll find milk tea, beef sandwiches and macaroni soup with sliced ham in these types of restaurants. My mother's favorite dish can be found in the Happy Valley district, in the shadows of the famed horse-racing track. 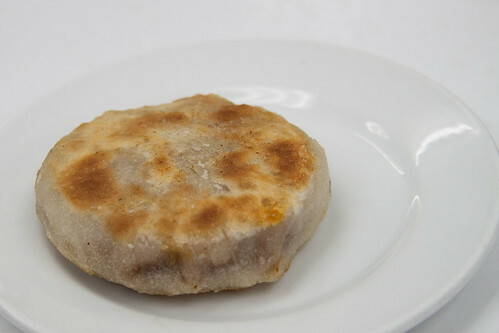 At San Cheung Hing, pineapple crust is a baked bun that contains no pineapple but is called this because its golden crisscross sugar crust resembles one. Inside the bun is a pad of the creamiest, sweetest butter a cow has ever bestowed, and the bread is warm and pull-apart soft. Tak Fat won't be found in any Zagat's guide. 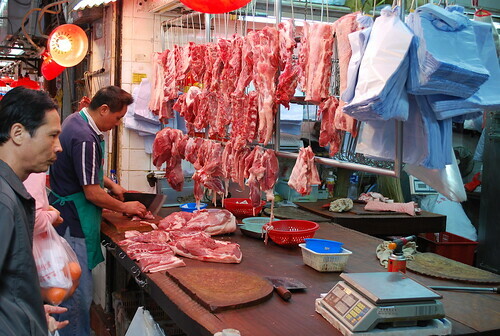 It's what is known as a dai pai dong, or the street market food stalls found in working-class neighborhoods. Dingy and without anyone likely to speak English, a dai pai dong, nevertheless, provides food that comes out lightning fast and is slurpably soothing. Like the wontons at Mak's, the meatballs at Tak Fat are delightfully snappy. How is this accomplished? Unlike American meatballs, which are ground, Chinese meatballs are pureed, pounded then formed, giving them a smooth texture that offers a rubber quality. Five golf-ball-size beef meatballs swim in thin egg noodles, with scallions and Chinese broccoli. This dish, thought to have originated at the 150-year-old restaurant, has been emulated so many times it's become Hong Kong's equivalent of the Buffalo wing. Despite the Swiss reference, there is no connection to Switzerland. The story goes that a Westerner visited this restaurant in the 1930s, and upon tasting these plump, rock-sugar and soy-sauced wings, proclaimed "Sweet! Sweet!" The chef thought the gentleman said "Swiss! Swiss!" A dish was born. See the beginning of this story. Makes my short list for a perfect dish. Expect long lines. By some accounts Lung King Heen, the three-star Michelin restaurant on the fourth floor of the Four Seasons Hotel in Hong Kong with its stunning view of the harbor, may the best Chinese restaurant in the world. Certainly no other Chinese restaurant has received such Michelin praise. When I visited Hong Kong last month, Lung King Heen was on my agenda. I had read about the strengths of the restaurant and was fortunate to rely upon the experience of “Ultimate Epicure,” and so did not choose blindly from the extensive menu, although I also relied on the guidance of my savvy server. There is much to commend the food. But what I remember most clearly relates to the fact that I was dining alone. When I sat down, I was provided reading material for the time between courses: Travel and Leisure and Christophorous Magazine, a magazine designed for Porsche owners, perhaps LKH’s market niche. Should I have been grateful (or disappointed) that I was not given the Guangzhou edition of Maxim? Different stokes, as they say. Cantonese cuisine used to be China’s culinary ambassador to the global maw, but today the style is seen less as exotic, but as fusty. However, Lung King Heen demonstrates that such a patronizing perspective is not essential. With its lengthy menu of well over 100 items, the kitchen is both skilled and flexible. I have had others Chinese dishes whose taste adheres to memory, but few that make such a claim to sheer opulence. The meal was superior, and yet surprise sometimes bowed to technique. 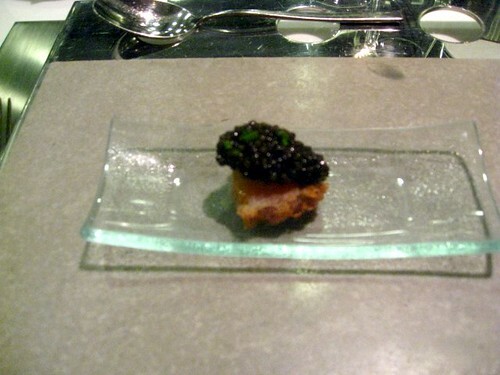 The innovative chef amazes from the first bite: the amuse astonishes. This was not the case at Lung King Heen, where my first bite was the saddest. 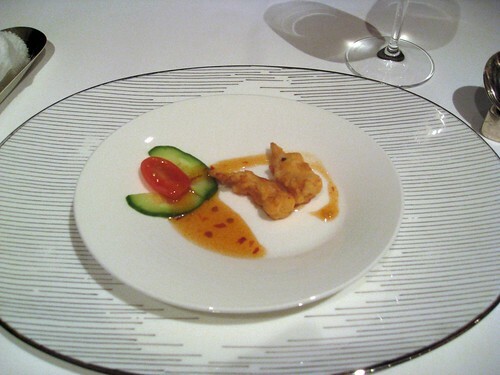 I begin with a tiny plate of crispy squid, tomato, and cucumber. The squid, heavily breaded was anything but crispy, and rather tough. What was I doing here? 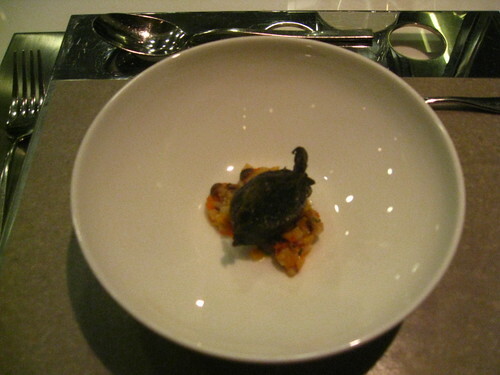 Were the Michelin inspectors asleep? My appetizer selection was imperfect, but more satisfying. I received a trifecta of roast goose with plum sauce, BBQ pork with honey, and BBQ suckling pig. The technique impressed me, but the small dishes varied in their pleasure. 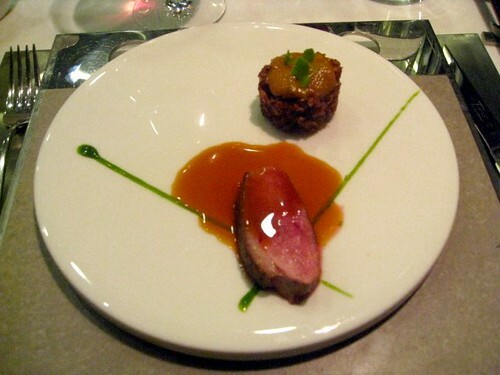 The goose was somewhat tough and the sauce was too cloying for pleasure. The pork was impressively sumptuous, but perhaps overly fatty. In contrast, the pig with a square of crackly skin atop was a memorable travel into the heart of pork with skin as crisp as crème brulee. Shark fin soup is not likely to be available much longer. One bends one’s knee to animal rights. I received a wallop of criticism from friends who don’t blink at eating eyeball tacos or blanch at foie gras. Still diners wish for a full life, if that can’t be said of the object of their appetite. 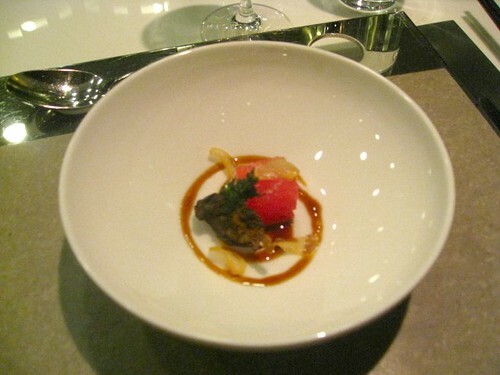 I selected a $100 US soup: Braised Superior Shark Fin Supreme Broth with Lobster and Gold Leaf. Here is conspicuous consumption that Thorstein Veblen would appreciate. The taste of this soup is not overwhelming, but the aroma and the texture is powerful. Perhaps I will never again choose shark fin, but this experience will last. 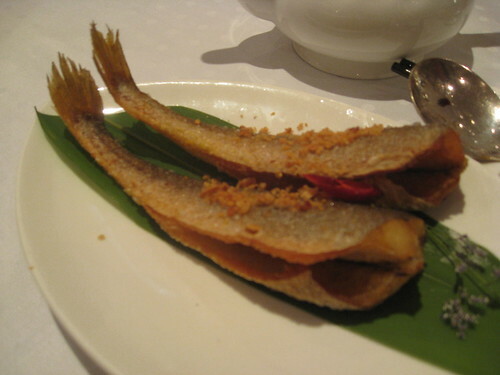 The dish was a concatenation of subtleties, and in this revealed the artistry of Cantonese cuisine. The chicken broth was a divine gift. The shark fin amazed, slightly chewy and slightly slippery: translucent but solid. The small amount of lobster was a fair partner for the broth. The gold, not strictly necessary, reminded me that this was to be the only C-note soup I would ever order. I followed this extravagance with a plate of wok-fried prawns with dried chili and shallots. Unexpectedly the chilies were not Sichuan-hot, but intensely flavorful. During my travels in southern China, I was served only a handful of dishes that reminded me of the “spicy-oily” dishes so common in American Chinese restaurants. 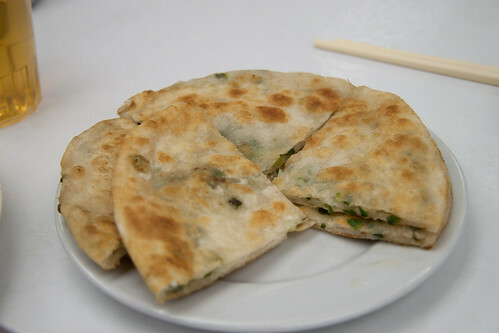 At Lung King Heen the heat never overpowered the ingredients, with shallots and cilantro providing a depth of flavor. Not a novel combination, the dish was intensely satisfying. 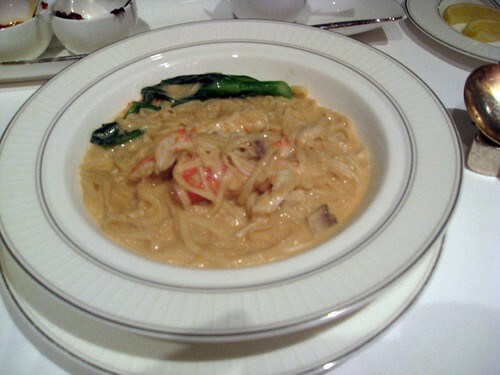 I completed my entrees with a luscious dish that I surely would not have selected had it not been for Ulterior Epicure’s advice: braised e-fu noodles with fresh Alaskan crab meat in Champagne sauce. East meets west. The sauce was as rich as any pasta sauce I can image: a roll in butter and bubbles. Crab, tender and sweet. The sauce had a French consistency, and the noodles a Chinese bite. E-fu power was the echo of luxe. For a moment I became a titan of industry passing between two worlds. What Cantonese banquet would be complete without a Bird’s Nest? 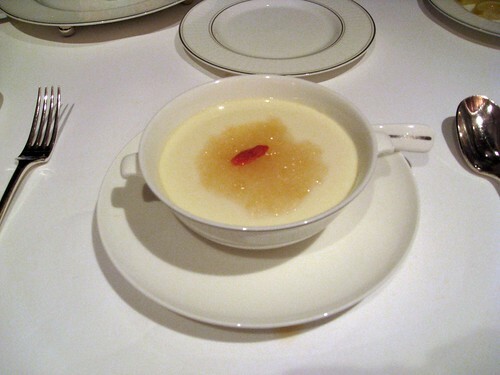 Rather than selecting a savory bird’s nest course, I chose dessert: double-boiled egg white milk custard with bird’s nest. The flavors were never overpowering, but the textural subtly matched the flavor notes with hints of ginger. The dessert was so remarkably smooth and so light that it might have been avian. 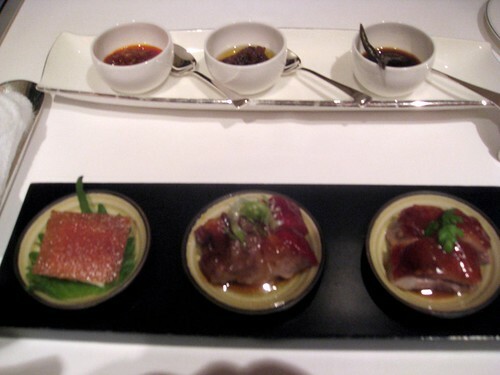 In all, I felt well-satisfied with Lung King Heen, even if I recognized the many leagues between the Four Seasons experience and the traditional Cantonese table. Still, when in Hong Kong, one might as well pretend to be Governor General. Last edited by GAF on February 21st, 2010, 12:34 am, edited 1 time in total. 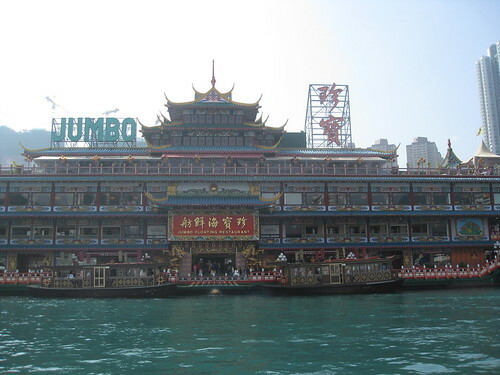 The Jumbo Kingdom Floating Restaurant off Hong Kong Island, near the Aberdeen Fishing Village (more like a very large and diverse marina) is a sight to be seen. It is a huge Hong Kong dim-summary: a gathering for parties, banquets, and tour lunches, although not a place to eat more than serviceable dim sum, less impressive than good (not great) establishments in New York, San Francisco, or even Chicago. I spent much of my first day in Hong Kong on a Gray Line tour to gain a sense of the city, and the Jumbo was where they parked us for lunch. The dim sum selections, understandably, if sadly, were from the dark edge of the menu: a dry Steamed Barbequed Pork Bun, a greasy shrimp egg roll, bland curry noodles, and a flavor-challenged shrimp dumpling. 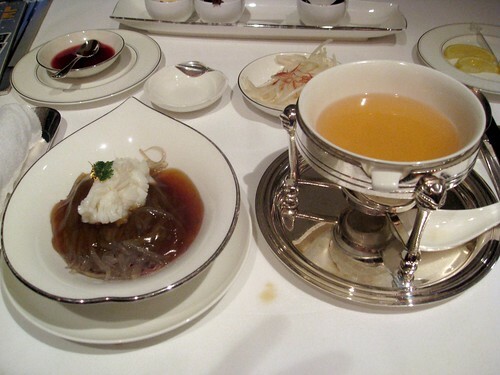 The only two passable dishes were those that I ordered personally, a sweet Chinese Ginger Juice Pudding although with only a whiff of ginger, and a crispy fried sesame beef ball dumpling. The greatest compliment that such a meal can receive is: filling. Things improved in that evening when my host – a Hong Kong native – selected a Shanghai restaurant, the Tsimshatsui branch of a chain, Shanghai Xiao Nan Guo Cuisine. The ambiance was clean and pleasant, muted, although somewhat generic, more what one describe as international style than distinctly Chinese (if Hong Kong can, in fact, be considered distinctly Chinese). The first surprise came at the start of the meal when water arrived (Jetlagged, I didn’t care for tea). The water was served hot, which my friend informed me is considered healthful in China. 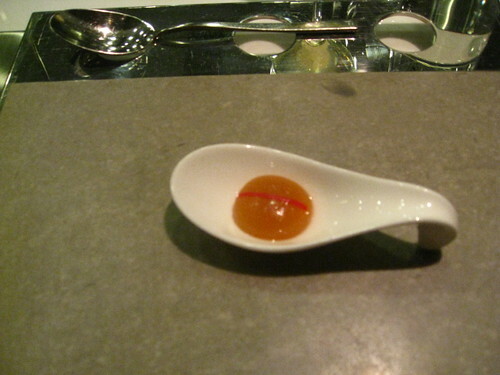 The second liquid surprise was the Chinese rice wine – rather like a sweet, dark sherry, also served warm (like sake). When a dried sour plum was added the wine gained a distinctive and pleasant musky fruit aspect. Even though there were only two of us, we ordered enough for a platoon: Asian trenchermen. The meal began with pungent marinated duck tongues. The enjoyment of the meat (and the very idea of the dish – no worse, surely, than foie gras) was moderated by the difficulty of consumption, nibbling the edges of cartilage while mismanaging chopsticks when half asleep: getting the tongue in my maw was easy, in removing less picturesque. 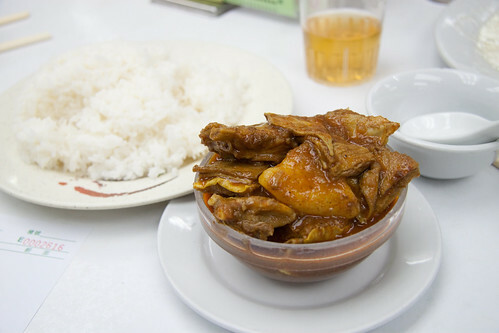 The tongues were soon followed by a pair of lightly fried crispy yellow fish – a small white fish with a yellow tail (not tuna-type yellowtail), the size of a large herring. It was beautifully fresh, airy, and crackly in all of the ways that fried food reveals its perfection. 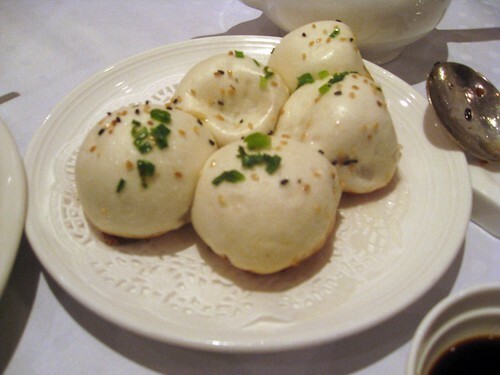 Steamed pork dumplings are a well-known Shanghai speciality, and these bocce balls, with soup hidden inside were sturdy if not startling examples of the genre. Less special – and heavy – was sticky rice with pork rib. I am confident that this dish is no worse that how the dish was intended, but it lacked a special appeal. For me – and my companion – the high point of the night was Fish Maw with Crab Yolk, advertising the Shanghai expertise with seafood. Astonishingly this dish was both eggy and slightly sour, a citrus note that cut through what could have been the unctuous quality of the loose egg sauce. Its revelatory golden color added to its appeal, as did the delightful fish maw and sweet crab. This plate was both inspired and awakening. We ended the evening with two sweet soups. 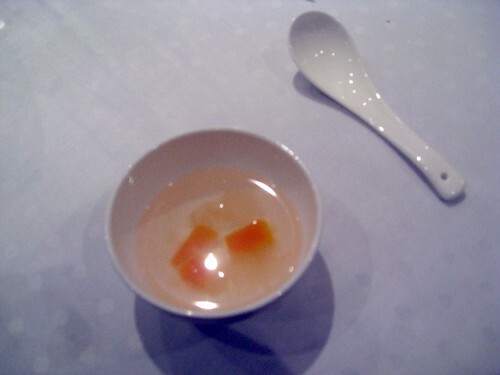 First, was a light and fresh Papaya in Broth: a wake-me-up that would served as a palate cleanser had it not been warm. 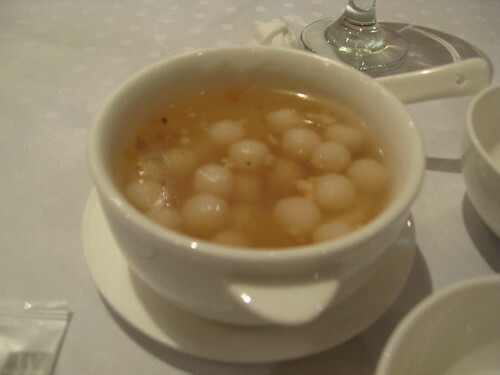 The final soup was a sugary rice wine soup with gelatinous rice balls. Had it remained with these ingredients, it would have been too heavy for a final note to this long symphony. Fortunately, in the liquid were some dried flowers which transformed this dessert into an incredibly fragrant memory – enough to recharge us into the warm January Hong Kong night on our way to the elegant Felix bar at the Peninsula. Last edited by GAF on February 28th, 2010, 10:58 pm, edited 1 time in total. Thanks for the report. The dim sum picture from The Jumbo is not showing up. I'd love to see that one. My experience at The Jumbo sounds like it might have been a bit better than yours. I was there for dinner and while the place is huge and solidly aimed at the tourist market, the tourists in question were largely Asian, rather than Westerners, so it wasn't as bad as the Disneyesque attraction it could have been. My dinner there was one of the most memorable of my Hong Kong visit, featuring a live drunken prawn preparation that was served in three courses. I didn't take any photos of the food at Jumbo, just the building. 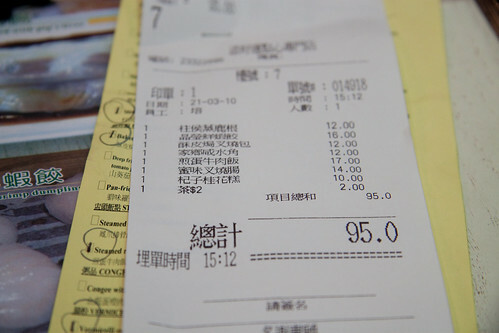 I'm sure that when one orders for oneself, the food is better (as was true for the two dishes that I ordered), but I was with a tour and the goal was to feed us cheaply and quickly, goals that were successful. GAF, thanks for the tip on a Xio Nan Guo in Hong Kong. I am heading for HK in two days. I really enjoyed XNG in Shanghai, actually, one of the XNG's in Shanghai had a spa attached, and I spent a lot of time in there, it was fabulous! Molecular Cuisine has become a global brand, a reality that has led some to suggest that its time has passed: the sun has set on foam, night has made deconstruction invisible. As an avid diner, my suspicion is that some of the bubbly enthusiasm has waned, but this is not necessarily a bad thing for the cuisine. We are at the point where experiments are not done for their own sake, but because they actually taste good – they create memories on the palate. In my attempt to collect stamps from all of the global molecular post offices, I knew that I would have to visit Bo Innovation on my trip to Hong Kong, presided over by “Demon Chef” Alvin Leung. 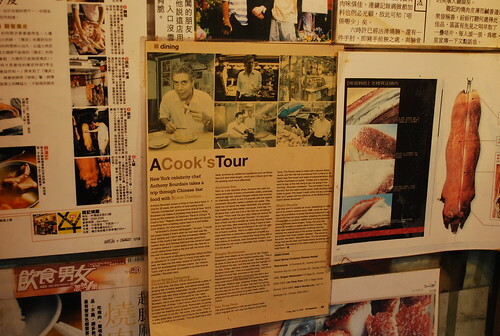 In the 2009 Michelin Guide to Hong Kong, Bo Innovation received two stars, but in the 2010 guide was demoted to one (perhaps revealing the danger of palling around with Anthony Bourdain on “No Reservations” and god knows where else! How many bad boy chefs can one world take?). But one star or two, Bo Innovation is a happening place, and eating at the kitchen “bar,” chatting with the cooks and servers, it reminded me of an Asian version of Washington’s Minibar. I give a lot of credit to AJ, the maitre d’, Mark, one of the servers, and Leah who was staging, for making my evening so congenial. Bo Innovation’s ploy is a relatively simple one – clever and generally successful. Chef Leung marries the techniques the molecular cuisine (cuisine agape) with a mixture of Asian and western flavors, but with an emphasis on luxe ingredients: the restaurant describes themselves as creating “x-treme Chinese cuisine.” Diners are required to order the tasting menu, which on the night I visited was approximately nineteen courses (depending, of course, on how one counts such things). As is so often true, not every course was fully satisfying. 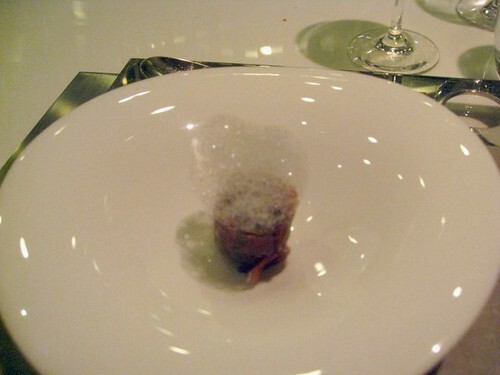 (The fact that French Laundry, Alinea, and a few others do makes their three stars all the more impressive). However, the ratio of hits to misses was agreeably high. While at times it seemed as if each dish was centered around a single Chinese ingredient, rather than being fully Asian, the incorporation of mou-tai, dried shrimp, lotus, or yak cheese added a sense of Orientalism to a menu that was structurally not so different from Minibar. One wonders if molecular cuisine can ever be truly Chinese, given different styles of cooking and presentation – and theories of food – or whether experimental cuisine will inevitably Western with Chinese touches. Bo Innovation does not fully answer the question. But if Bo Innovation is not stratospheric in its creativity, there was enough vision to allow the meal to be worth recalling with delight. 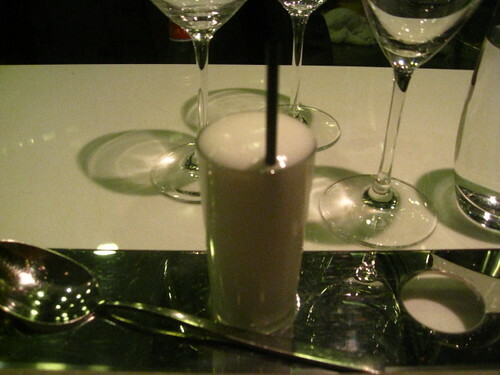 1)	Mou-tai Sour combined with fluffy egg whites – a pleasant amuse and palate cleanser. Although Chef Leung incoporatored Mou-tai (the Chinese liquor made from sorghum molasses, giving the drink a light molasses taste), it was basically a standard molecular treatment. 2)	Escargot with compressed watermelon, Sichuan vinaigrette with crispy garlic, fried greens – beautifully composed, but again the style is Western with Chinese ingredients. 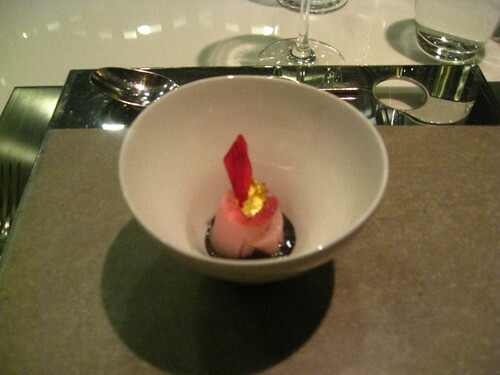 4)	Hamachi with black sesame, crispy rose essence ginger – beet juice for ginger, amazing Japanese inspired – for my taste this was the most accomplished dish of the evening. 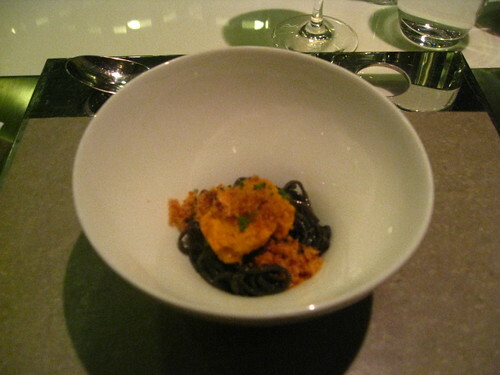 5)	Sea Urchin, ink noodles, chili oil, and “har mi” (Sun-dried shrimp) – very distinctive taste, brave flavors, although perhaps too strong in terms of what came before and after. 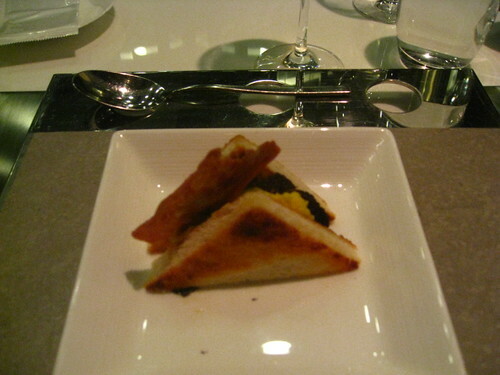 6)	Black truffle sandwich, “chian dan chee” – crispy spam and egg sandwich with truffles – one of the best sandwiches I have had with a distinct truffle aroma. Chef Leung is in this menu quite partial to truffles. 7)	Iberico 36 (months cured ham) with morels and porcini, Korean vermicelli, and onion foam – one of the best dishes of the night, a one-bite wonder that effectively combined tastes. Molecular “xiao long bao” – a “dumpling” in a bladder – pork stock with a line of pickled ginger on top, but how Chinese was it really. A cute and pleasant dish, but limited in its appeal. The idea overwhelmed the taste. 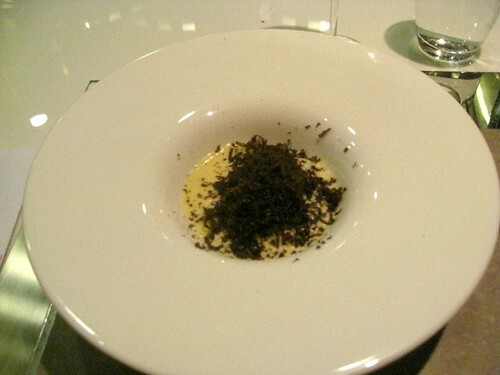 9)	Yak and Mac – with black truffle bits – ok, but not so different than mac’n’cheese – Yak cheese, not as good as the yak butter tea that I had from a Yunnan food stall a few days before. But another cute idea. 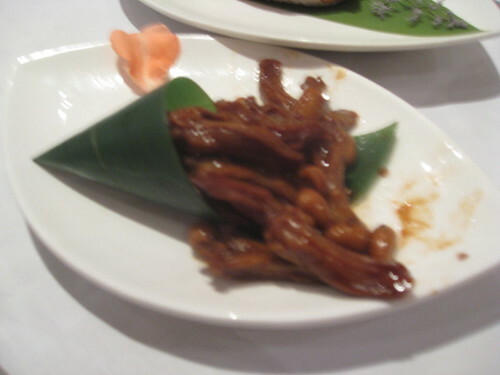 10)	Frog Leg “beggar style” – frog thigh stuffed with lotus and shiitake – on small diced vegetables (again, despite the fact that it was based on a traditional Chinese dish, one wonders how Chinese it was? It seemed like a Western appropriation of Chinese cuisine.) Still, the flavors were impressive. 14)	Sweetbread – oyster sauce (somewhat think but bright) lettuce tempura, artichoke puree – excellent dish; impressively prepared, but it is the oyster sauce than made it Asian. 15)	Chalon duck with longon, red rice and preserved kumquat – too gingery to my taste, and one of the least successful dishes of the night. 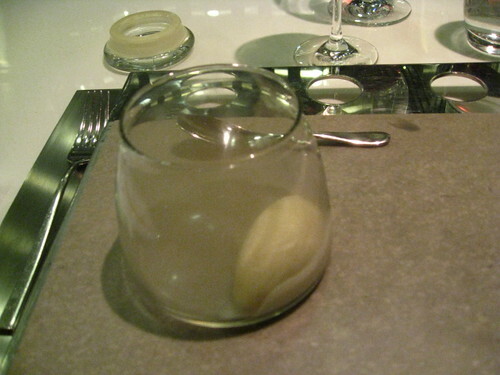 16)	Almond with sandalwood smoke – a nosegay that is reminiscent of some experiments at Alinea – “Chinese temple”, nice almond ice cream but not revelatory. 17)	Shui Jing Fang – poached caramelized banana and dark chocolate ganache (but served without chocolate since I am caffeine sensitive) mint, rice wine liquor – very nice, and probably better with the ganache. 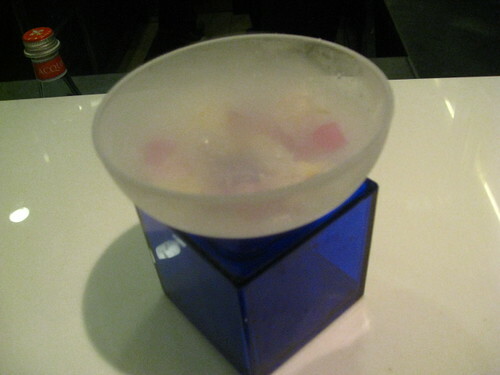 19)	Jasmine kiss – jasmine flowers with liquid nitrogen – another fragrant moment with a tip of the toque to Grant Achatz at Alinea. I left being fully satisfied by the evening. Bo Innovation provides four-star cuisine, but in its glory raises the question of how Asian molecular cuisine can truly be. Is molecular cuisine always and ever to reflect Western culinary imperialism? I see where you're coming from, but does Spain and the U.S. "own" MG simply because they are more entrenched/more visible in these locales than in Asia? Seems to me that your meal was merely more evidence of pan-globalism rather than emasculated emulation. I don't think that the US or Spain owns molecular cuisine, but the question is whether Bo Innovation is creating a true fusion or a borrowing of techniques applied to a few Chinese ingredients. Cynthia wrote: Jumbo Restaurant is a must see -- but avoid eating there. Maybe cocktails. But the food I had there was awful. However, when you're a giant floating restaurant covered with a million lights, with 12-foot gold dragons with flaming eyes flanking the door, all reflected in the surrounding water, I guess you don't have to think about the food. Definitely one of the visual delights of Hong Kong, but not a culinary highlight. Wow, is this place still around? That's good to know. Yes, it's a really lovely setting. Probably too late for the original poster, but here's a recap of some of my meals from a trip to Hong Kong last September. 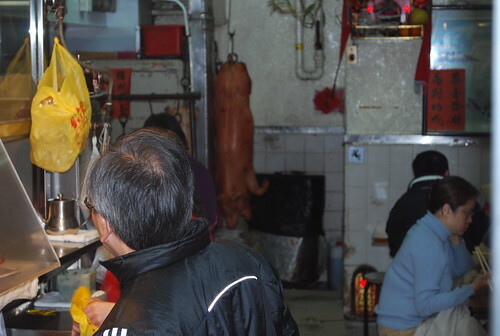 What does a pork-loving Jewish boy do when dropped in to the veritable swine-eating Mecca that is Hong Kong? 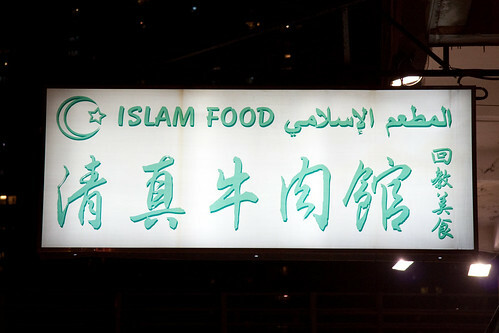 Go for Halal food. Though certainly not the best I've ever had, this was tasty enough and provided a good mop for the mutton's sauce. This right here was worth the trip. I wish I had an interior shot photo, but once you bite in, you're fairly well committed to finishing it. The description in tyrus' post above is dead-on accurate. The rich, spicy, deeply-beefy juice enclosed within the crisp shell is well worth the price of admission. Unlike a small XLB, there's a ton of juice in there and I was able to sip away, while nibbling at the meat puck and crust. 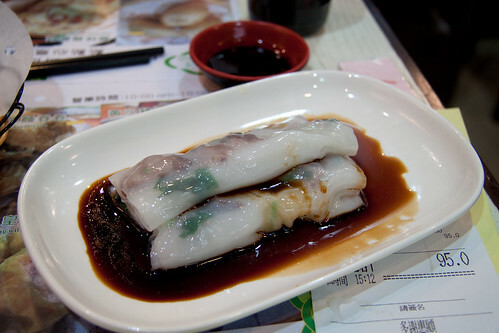 I had something very similar to this (though not as good) in Golden Mall at stall 38 ("Xie Jia Cai"?). The mutton was nice and fatty, with the connective tissue softened nicely. Most of my pieces were bits of rib cage, which always has nice deep flavor. All in all, worth the visit. Kowloon City (which I walked around after dinner) is apparently known as Little Thailand. With a small group for more ordering power, I think you could make a really nice afternoon of the area. I was surprised by the large number of "Islamic" Restaurants that I saw all throughout Yunnan province (in the Southwest part of China). There is a huge Muslim population in China. Other than the choice of meats (no pork, for instance), I wasn't sure if there was much difference in forms of preparation. I wanted to do the dim sum thing when I was in Hong Kong, but traveling by myself, the idea of a huge restaurant with 12-person round tables didn't make sense. I had heard a bit about Tim Ho Wan, and it turned out to be a perfect fit - tiny, cheap, delicious, and Michelin starred to boot. I showed up mid-afternoon, waited about 30 minutes to get a number, and was then warned by someone in line that it would take at least 2-3 hours for my number to come up. I took a nice walk around the neighborhood, staved off my hunger with some street food snacks, and made it back just in time for my number to be called (in Cantonese... a friendly person in line let me know it was my turn). 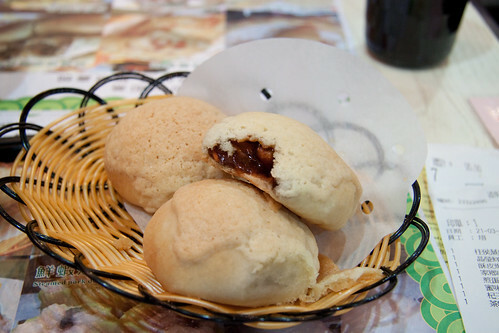 These baked buns are one of the famous items at Tim Ho Wan. The pastry itself is light and flaky, topped with a sweet crunchy layer (apparently made from lard and sugar). The filling was scorching hot (these were served directly out of the oven) BBQ sauce with pieces of char siu. The combination of sweet bbq sauce and sweet topping made these sugar-bombs, in my opinion, but tasty nonetheless. Wow. Nothing seemly-complicated here - small bits of pork, a little scallion, rice noodle and soy sauce - but perfect execution. Soft, yet slightly chewy, these tendons had a pleasantly gamey flavor. These were incredible. The tacky, handmade wrapper gave way to a chunky (yet still cohesive) filling of shrimp. I had no idea what this was when I ordered it (described as a "cake" on the menu, I believe). 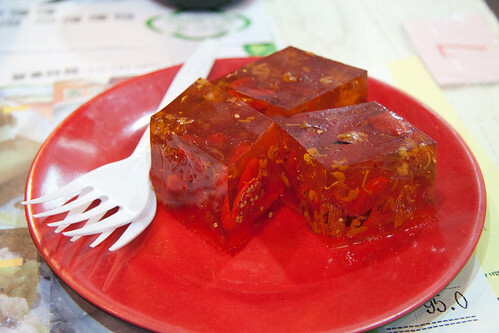 Turns out to be a sweet, herbal jello with bits of dried berries floating inside. The shrimp dumplings and crepe look perfect! Thanks for the post and photos. Dmnkly wrote: If you have a native speaker with you or are feeling particularly brave, some of the best meals I've had in Hong Kong have been at Lei Yue Mun, the outdoor fish market, where you can walk around, pick out all kinds of live seafood from tons of vendors, and runners will take it to a restaurant around the corner where the first plates will start hitting the table when you finish your shopping and have a seat. It's been a long time since I've been and we always went with somebody who spoke, so I'm not sure if language might be an issue. But if you can make it happen, ho buddy. I love the sound of this place, as well as Tim Ho Wan (mentioned by dansch). We'll be in Hong Kong for a few nights, and I'm least interested fancier places, most interested in places just like these two...and night markets. I was there in December and I actually didn't eat that great (it was the last stop on our trip and we were to the point where tracking down food was becoming less and less a priority). We had dim sum at Maxim's City Hall and soup noodles at Max's, which were a mixed bag. The former is unnecessarily fancy and the food suffered for it...dishes were consistently at or below the level of Phoenix, in my opinion, while the latter had a quaint hole in the wall feel and was a great value, but it's nothing spectacular. Certainly worth a stop if you're in the area, or maybe worth a trip a bit out of your way if combined with the egg tarts at Tai Cheong Bakery just up the street. We popped into an outpost of Crystal Jade on our last night, and I thought the XLB were stellar and really enjoyed the la mian fried w/ pork & black mushrooms. Perhaps we sucked out by going to a chain, but it was probably the best meal we had in HK (given the caveat that we didn't put too much effort into picking our destinations there). I haven't had a chance to write up my recent trip to Hong Kong (it'll happen soon), but I can point you to openrice.com. Their recommendations were excellent. On a totally non-food theme, I'm thinking I might have a jacket or suit made in Hong Kong. The most excellent Kevin Pang suggested Simpson Sin tailors...but we're only there two days, and one of those days is a Sunday, so may not have time. When I was there, I had about a dozen shirts made and two suits. I think the whole operation took 4 days, but you might be able to get a rush job.